Home Local News Really? 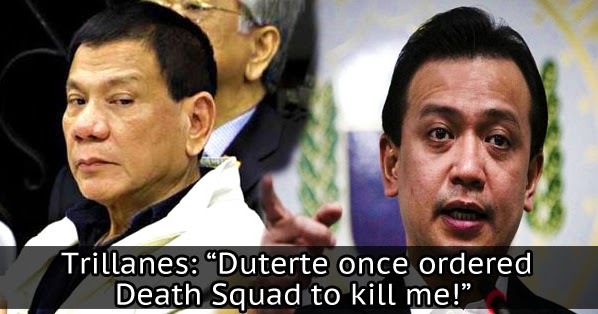 Trillanes: Duterte Once Ordered Death Squad to Kill Me! Really? Trillanes: Duterte Once Ordered Death Squad to Kill Me! Retired policeman SPO3 Arturo Lascañas backtracked his previous sworn statements during the senate inquiry on the alleged Davao Death Squad led by former mayor of Davao and now President Rodrigo Duterte. Lascañas belied the claims of witness Edgar Matobato denying the existence of the death squad who is supposedly responsible for the spate of drug-related killings in Duterte's hometown. Among the revelations of Lascañas is Duterte's order to kill senator Antonio Trillanes IV, which Trillanes revealed to CNN during an interview on Tuesday. "He even ordered me killed. Sinabi na yan mismo ni Lascañas," Trillanes said. "But I am not afraid of him at hahabulin ko talaga siya until mapakulong ko siya, kasi ang dami niyang kasalanan sa ating bansa." Lascañas revealed that the President once eyed Trillanes as a target for killing last year. "Prior to yung public confession niya, sinabi niya na Duterte through Sonny Buenaventura wanted to have me killed," he said. SPO4 Buenaventura served among Duterte's many aides. "Kaso nag-alangan nga siya at sinabi niya nagsusuggest siya ng ibang mode... to get rid of me. So humingi siya ng dispensa sa akin." "Sabi niya baka puwede kung i-ram daw ako ng truck or something to make it look like an accident," Trillanes said. Last year during the May Presidential elections, Trillanes was among the most vocal critic of Duterte. Trillanes accused Duterte of hiding a tremendous amount of cash about P2 billion in his accounts. Trillanes also emphasized that Duterte sponsored extrajudicial killings during his reign as the Davao city mayor. Sponsor The self-confessed hitman and leader of the alleged squad affirmed its existence. Lascañas also pointed Duterte to be behind the killing of radio broadcaster and critic Jun Pala. However, many in the senate remained skeptic in regards the confessions of Lascañas claiming that his credibility is now tainted due to confessing that he lied on his sworn testimonies, among those is Senator Richard Gordon, chairman of the justice panel.